Tom Ford Fall 2013 Private Blend Atelier d’Orient Fragrances . Tom Ford expands his Private Blend collection with the Atelier D'Orient range. 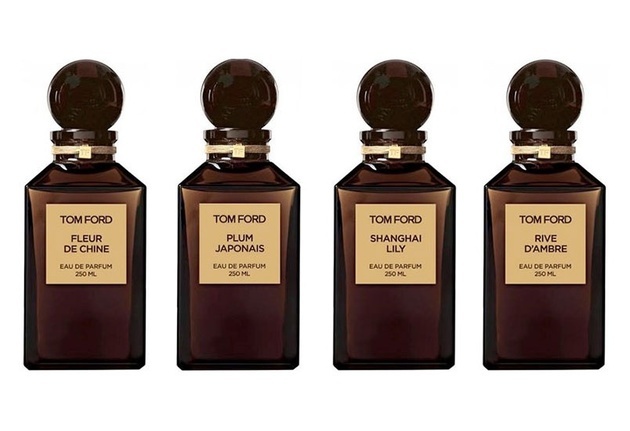 Starting with fall 2013, the Tom Ford fragrances empire will expand with four exciting additions: Plum Japonais, Fleur de Chine, Shanghai Lily and Rive d’Ambre. Like the names suggest, the Tom Ford Atelier D'Orient fragrance line takes its inspiration from the Asian continent. An “unequivocally romantic” floral scent, Fleur de Chine blends exquisite notes of Hualan flower and star magnolia, clementine and bergamot, hyacinth, jasmine tea, syringa, plum and tea rose, wisteria, white peach and soft tree peony Hinoki wood, Chinese cedarwood, amber, rare benzoin Laos, styrax and vetiver in a complex bouquet which will never fail to attract attention. A luscious and sensual scent, Plum Japonais is inspired by the Ume plum which is combined with exquisite floral notes for an incredibly complex scent which will appeal to true connoisseurs. The defining notes of the scent are: saffron, cinnamon bark Laos, everlasting flower, sawara cypress, camellia Japonica flowers and rare agarbois and vanilla. Opulent, tantalizing and elegant, this ultra refined and rich scent features spectacular notes of bitter orange, pink peppercorn, rich black pepper, clove which are combined with jasmine, rose and tuberose, vetiver and cashmeran. Rich notes of cistus labdanum, guaiac wood and vanilla finish off this intriguing scent. Like Shanghai Lily, Rive d’Ambre features bitter orange oils, however it features a more elegant blend of scents. Bergamot, lemon, tarragon, cardamom and Moroccan spearmint oil, pear wood and amber are the defining notes of the spectacular new scent. The Tom Ford Private Blend Atelier d’Orient collection will be available starting with September. The pricing for the fragrances will be as follows: $210.00 for 50ml/1.7 fl. oz. EDP; $520.00 for 250ml/8.4 oz. EDP.